Oscar-winning musician A.R. Rahman’s track “Ruby Ruby” takes Sanju to the ‘80s with a zingy twist. Wouldn’t life be colourful if what you imagined became a reality? 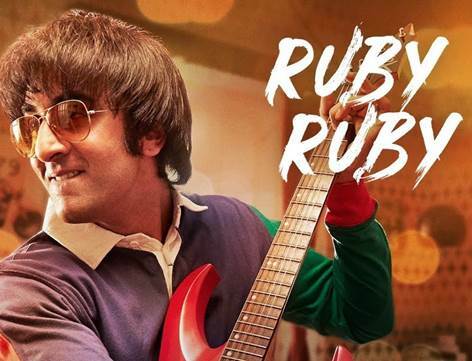 Presenting “Ruby Ruby” a song depicting Sanju’s quest for love as he lets his imagination run wild. Based on the life of Bollywood star Sanjay Dutt, and directed by Rajkumar Hiran, the Ranbir Kapoor starrer Sanju is very close to its release date on 29th June 2018. Along with Ranbir Kapoor, Sanju also stars Paresh Rawal, Sonam Kapoor, Anushka Sharma, Manisha Koirala, Vicky Kaushal, Dia Mirza and Jim Sarbh in vital roles. SANJU is directed by Rajkumar Hirani and is produced by Vinod Chopra Films and Rajkumar Hirani Films in association with Fox Star Studio.